* Past Events and Fireside chats can be found here. * Business Tuesdays at MalamaDoe! * Our Fall Fireside Chat series has ended. March 27, 2018 – Fireside Chat with Jackie Steinmetz. Jackie Steinmetz is the CEO of Accelity Marketing, a Milwaukee-based marketing agency that drives growth in B2B software startups. RSVP for the event here. Join us 2/27 for our first Fireside Chat of the spring! Marian Singer, co-founder and CEO of Welntel, a groundwater technology company, will lead this exciting chat! OCTOBER 2017 – Our Fireside Chat series was held in October. More information about our speakers is available here: MalamaDoe_FiresideChats2017_sign_8-23-17. 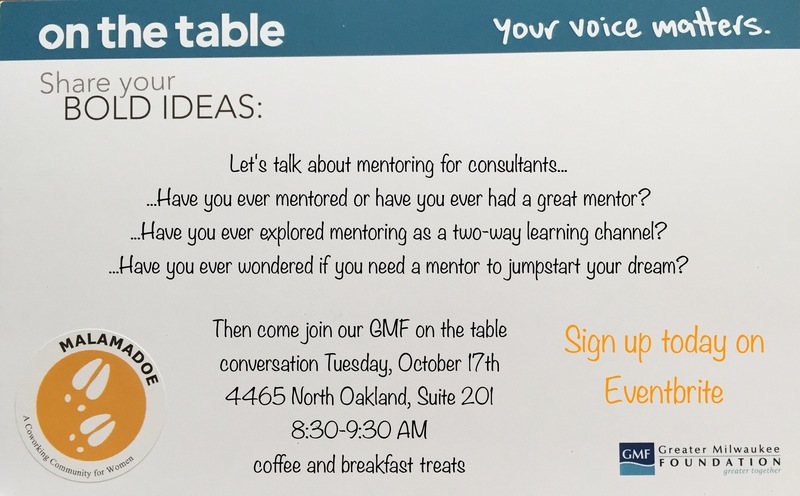 OCTOBER 17, 2017 – Greater Milwaukee Foundation – On the Table event.